Even stars get stuck in traffic jams. 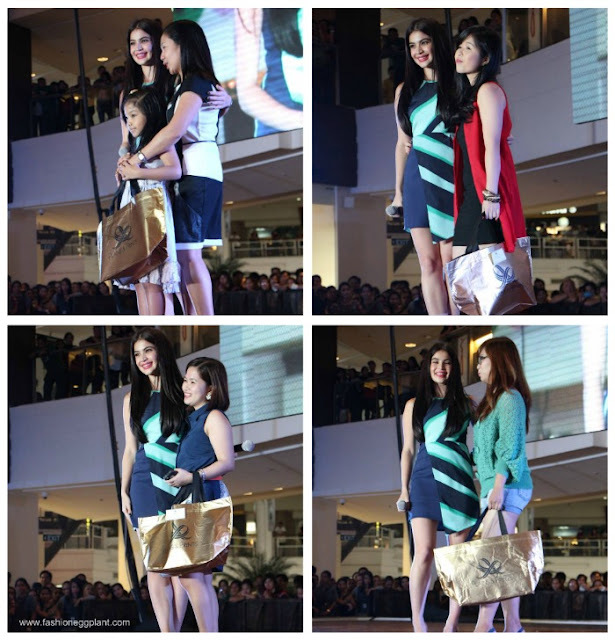 Yesterday was the launch of Anne Curtis as the newest face for Plains and Prints. The occasion was split into two events and in between the two, Anne had to shuttle to and from another commitment with a different brand (talk about busy)! She arrived for her 630 show several minutes late but instead of looking haggard and stressed, she immediately belted into her own version of David Guetta's Titanium in one of the most high energy performances I've ever seen. Her enthusiasm definitely makes up for whatever she might lack in singing talent. Anne Curtis is definitely a breath of fresh air and it is this trait as well as her undeniable flair for fashion which drove Plains & Prints owner Roxanne Ang Farillas, to personally handpick her as the newest face of the brand. According to Anne: "I find in the brand a lot of options that I'd wear every day to different functions. wether for a daytime show or late-night affair. I prefer feminine cuts and silhouettes, Plains & Prints works for me because their clothes really compliment my style". Plains and Prints Pre-Fall collection is divided into two themes, Berlin, which is their take on the huge black and white trend this year but with a splash of emerald, and Pink Persuasion, which is the brand's modern take on feminine dressing. Both feature trhe brand's unique take on classic pieces such as layered A-line dresses, skirts with cut-out designs and shift dresses with large floral prints. Plains and Prints new pre-fall collection will have you conquering both the inside and outside of the boardroom looking sophisticated and uber stylish just like their latest muse, Anne Curtis! Chiffon A-line V-neck Sleeveless With Applique And Beads Wedding Dressis an entirely various recreation, you might be able to enjoy!